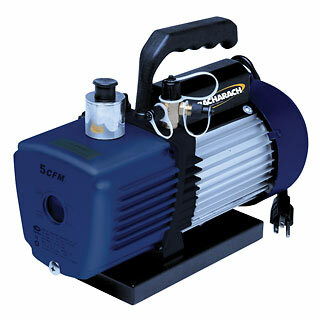 This is the perfect pump for the residential service technician. Attached to the TTT RapidEvac kit it is a solid performer. For residential, there is no advantage of using a larger pump for evacuation due to size of the lines used for evacuation and the serious resistance that they put on the rate of gas flow under high vacuum conditions. Remember, a perfect vacuum is -14.696 psig, the physics of vacuum is the limitation. A larger pump can create no more flow in a deep vacuum than a smaller pump when the line size becomes the limiting factor. Bigger is not always better. A small pump means less oil, less weight, and less current draw allowing lighter extension cords. Need more information on vacuum? Visit our vacuum training pages. 225 TruReward$ points will be placed in your account when you buy this item.